Last Thursday's snow storm and treacherous road conditions caused numerous slide offs and stranded motorist throughout the county. 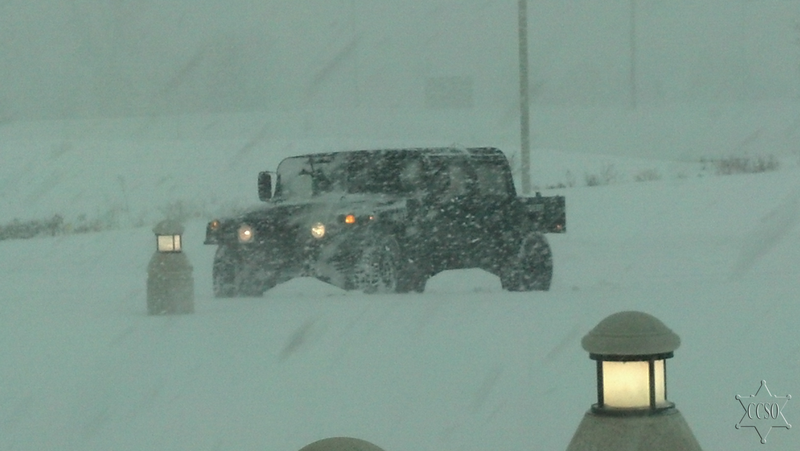 In just 24 hours the Sheriff's Office responded to 62 weather related calls, which included more than 40 stranded motorist and 7 non-injury accidents. Conditions were predicted to be so bad that Sheriff Diehl activated a newly formed unit, the Sheriff's Office D.E.R.T. Team. 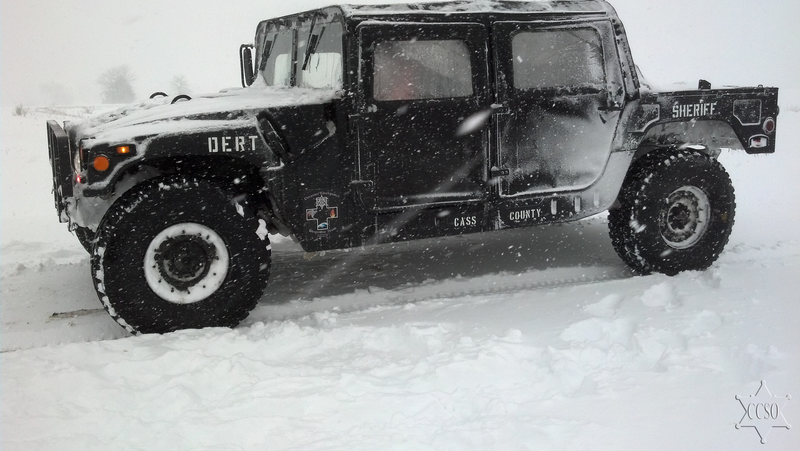 The Cass County Disaster Emergency Response Team (D.E.R.T.) is a team of 14 deputies who receive training in the areas of Search and Rescue, Advanced First Aid, Chainsaw Operation, Heavy Machinery Operation, and Disaster Scene Security, as well as Disaster Planning. The idea for the team began in May of 2011 when an EF5 tornado struck the City of Joplin Missouri. Within hours of the incident deputies from the Cass County Sheriff's Office responded to the scene to lend assistance. Upon arrival deputies were tasked with a variety of scene security, and generalized patrol functions. These deputies returned with a vast amount of knowledge of what types of confusion a disaster of this magnitude could create. Many of the roadways were impassible to normal vehicles, equipment was in short supply, and additional training would have been helpful. To assist the team, the Sheriff's Office contacted the US Military for equipment. They provided the team with search and rescue gear, first aid supplies, survival gear to include an 18' by 32' recovery tent, as well as two M998 HMMWV's. The equipment is issued by the military at no cost to Sheriff's Office or the citizens of Cass County. "Our main goal is to have our team equipped and depart our office within an hour, respond to the scene, provide a multitude of different types of assistance, and remain self-sufficient for extended periods of time without outside contact" said Sheriff Dwight Diehl. The Sheriff's Office maintains a mixed fleet of patrol vehicles that includes 4X4 vehicles, SUVs, and trucks for use in inclement weather and rural conditions. During this storm the D.E.R.T. 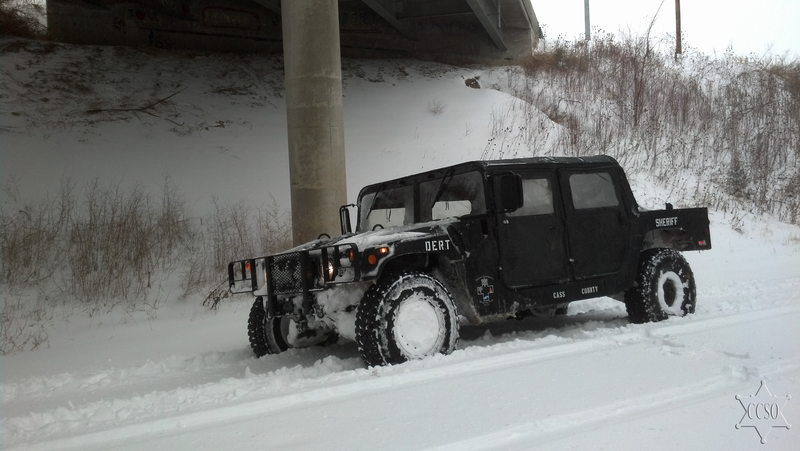 Team’s Humvees responded to numerous calls as well as transporting essential personnel to and from the Sheriff's Office. In preparation for tonight's snow storm the Sheriff has once again activated the DERT team to assist during the storm.